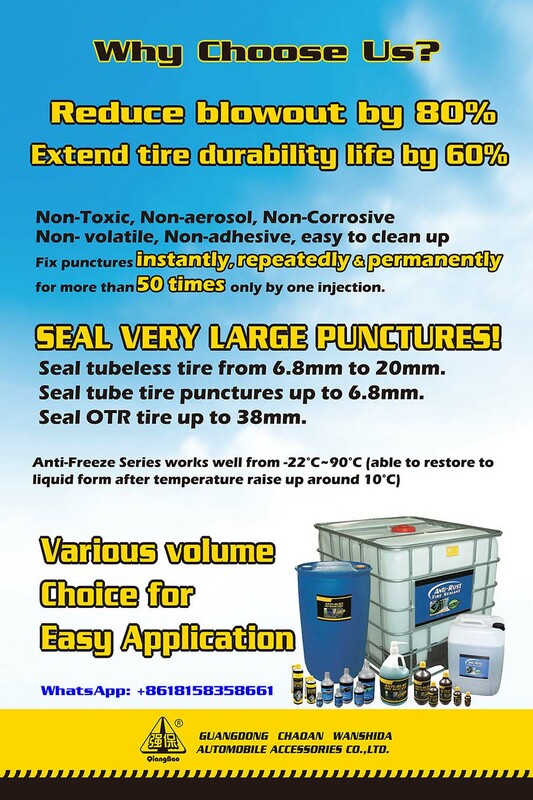 why choose Qiangbao as the first choice tire sealant manufacturer in China? ⊕ Qiangbao tire sealant features of non-corrosive, non-adhesive. Reduce tire burst, seal big punctures, seal tube & tubeless tires, extend tire life and seal punctures repeatedly. ⊕ Our price is relatively a bit higher than other brand, but it seals big punctures other brand does not seal. Our price is a bit higher because we invest much in bottle quality, bottle cap redesign, packing quality control and formula improvement that contains 18 materials. ⊕ Qiangbao tire sealant worth more than its price, you pay only for a little to have your tire protected from punctures for 6 month, during this period, the tire sealant will continuously seal punctures repeatedly for more than 50 times. It is worthwhile if the tire sealant seal only 4 punctures, which is cheaper than to get it done at repair shops, let alone it can seal more than 50 punctures. The sealant seals the puncture so quick that you won’t ever notice, you keep driving like nothing happened, no waste of time, you won’t miss a date, a contract, a flight, and many other important events. ⊕ There is no specific location and time when tire get punctured, it can happens right in area of nobody when any incidents could happen. Using Qiangbao tire sealant could lower the risk of unfortunateness. ⊕ Do not ever use plugs when you can use Qiangbao sealant to solve the problem. It destined to have re-leak with plugs, repair shop usually will add one more plugs when you have the re-leak, your tire is screwed when there 3 plugs used on one punctures. It is smart to use tire sealant correctly and avoid the waste of the tire only for one puncture.